Wow! 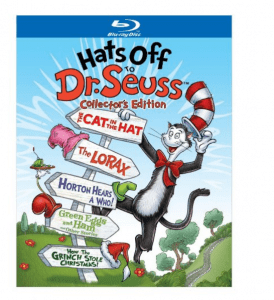 Right now you can get the Dr. Seuss: Hats Off to Dr. Seuss Collector’s Edition (Blu-ray) for a great deal! This Collector’s Edition has all the great favorites! Celebrate Dr Seuss with the theme “Hats Off to Dr. Seuss”, a year long celebration of the 75th Anniversary of “The 500 Hats of Bartholomew Cubbins”. Both DVD and Blu-ray will include fan favorites; The Cat in the Hat, Green Eggs and Ham and Other Stories, The Lorax , How the Grinch Stole Christmas, and Horton Hears A Who! Head over to Amazon to snag Dr. Seuss: Hats Off to Dr. Seuss Collector’s Edition (Blu-ray)!